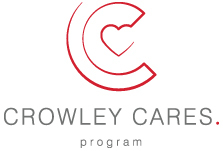 Since 1984, Crowley has provided more than $3 million dollars in scholarship funding for more than 1,000 students. The company has also donated more than $2 million over the years to support other educational programs. In 1994, Crowley Chairman and CEO Tom Crowley Jr., established the Thomas B. Crowley Sr. Memorial Scholarship Program, in honor of his father, who guided the company to extraordinary heights before passing away in 1994. The company continues to give scholarship dollars to deserving students in the U.S., Alaska and Puerto Rico. In 2006, the program expanded to Central America and to date has provided financial assistance to 20 students in that region. Today the company provides scholarships to the academies and institutions listed below. Students and educators interested in learning more about the scholarship and requirements should contact the school’s financial aid office directly. Students should ask for the “Crowley Maritime” scholarship when making inquiries.